Flash Blackjack - Rebrandable casino games for licence. Blackjack joins the other casino games by Galaxy Graphics, Fruit Machine and the Wheel of Fortune to help introduce the Vegas feeling to your website or marketing campaign. Gamble with $1000 (for entertainment only) and use your luck and skill to increase your funds. The dealer must stand on 17 and must draw to 16, so your odds are the same as in a real Vegas casino. The game uses one standard pack which is reshuffled every time the cards are drawn, so no card counters can help here! If you are interested in licensing this Blackjack game for your own site, or a custom rebranded variant of it, please contact us for more information. Looking for Blackjack source code / Actionscript 3.0 / .fla file ? The source code for this game is also available to buy from Galaxy Graphics. 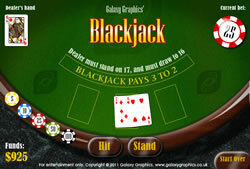 Click here to contact us about Blackjack source code.